Ben said he likes "all the colors" and patterns like stripes, plaids, and paisley. When I asked him to choose a fabric he really liked from my stash he chose a hideous rainbow stripe that I must have found in a remnants bin. Sigh. So I made an executive decision on a loose color scheme that seemed to work and started cutting! Ben is 6'2" or so, so the quilt finished at 72"x81". I knew I needed to use something really soft on the back, so I found two fabrics on sale at Hancocks. 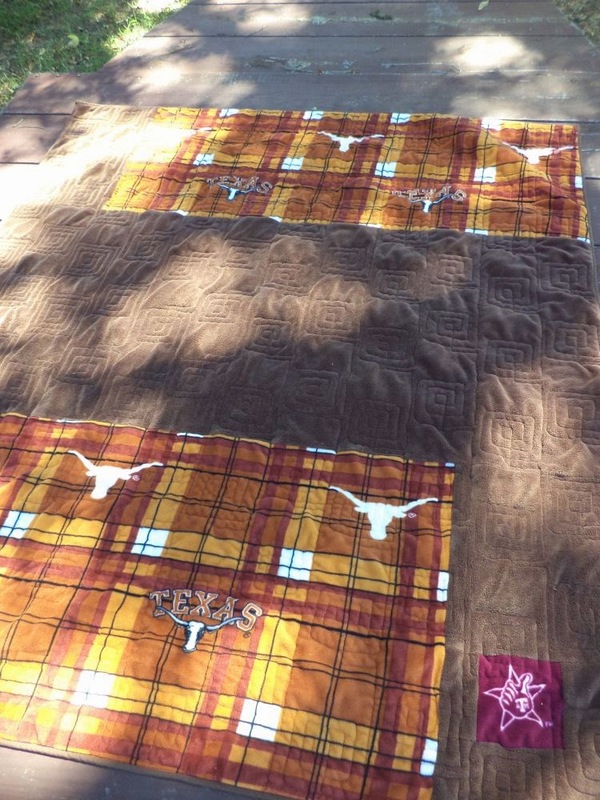 The Longhorns fabric is fleece. They had several Longhorns patterns and I picked the most attractive one, but it was a stretch. The brown fabric is a kind of fleece too I think, but more minky like. Someone described this as like someone skinned a chinchilla :) Very very soft, deep pile. For those of you who don't live in Texas, A&M and UT are the two big state schools and they have a fierce rivalry. I went to A&M, Ben went to UT. I did the majority of the backing in his school colors but I had to add in a little A&M patch, since it's coming from me and all! 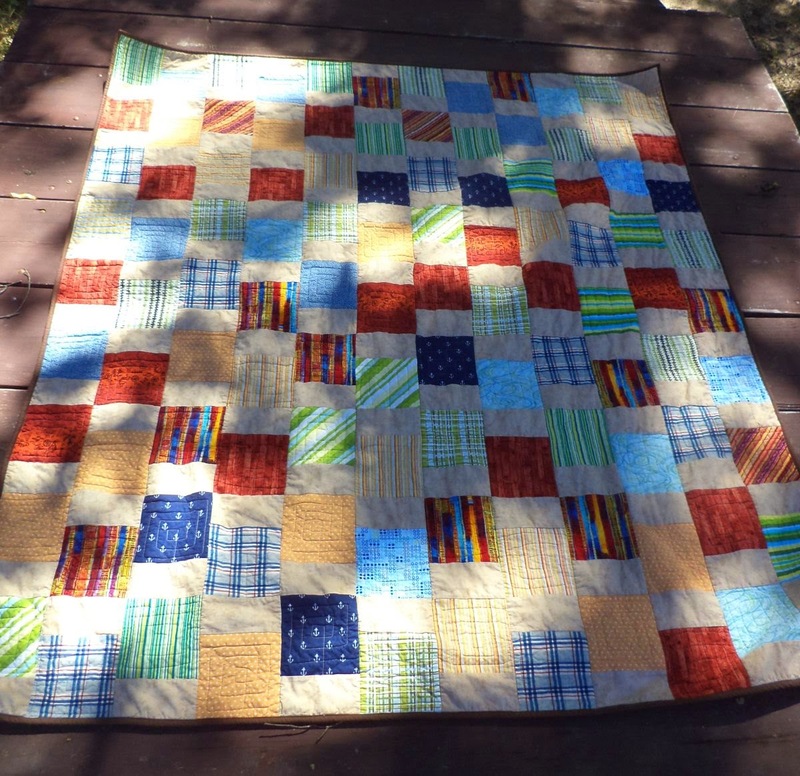 I was worried about how the quilting would go with the stretchy, fluffy fabrics on the back but it was fine. I had no puckers, folds, nothing! 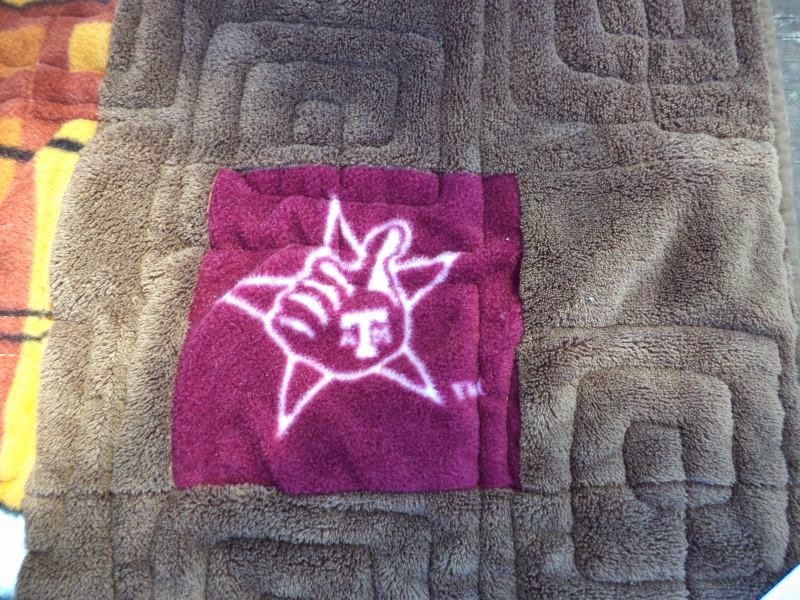 Plus the quilting shows up so nice on the back. 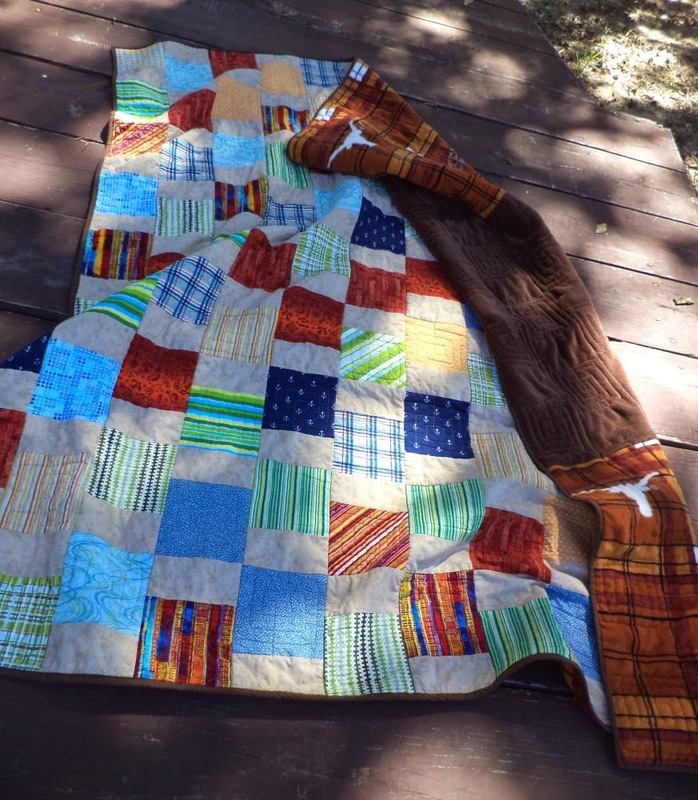 I did FMQ square spirals in all the blocks, which made it easier to tackle such a large quilt. One block at a time! 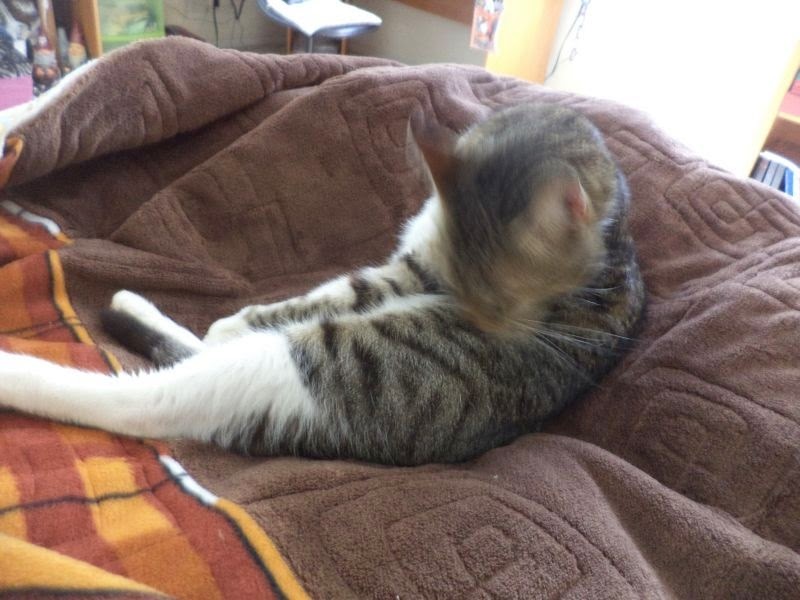 Wilson really enjoyed the fluffy brown fabric. I've since made him a cat bed covered with it in the vain hope that he will sleep on it instead of in my lap when I am trying to sew! Labeled, folded and ready to go. It was received with much excitement and it already being used in its new home! 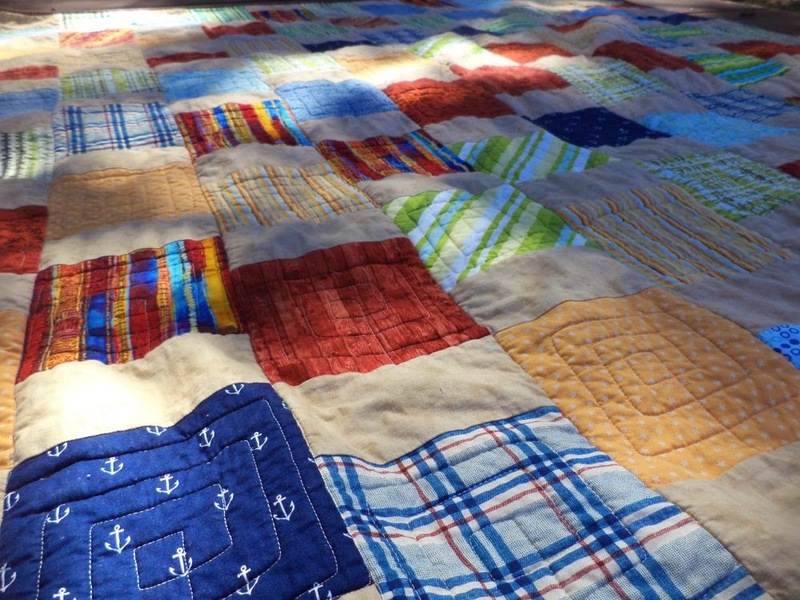 Linking up to Crazy Mom Quilts Finish it Friday! Congrats on the finish! I'm guessing that Ben will treasure his new quilt. I've thought about using fleece as a backing. Thanks for sharing the process! 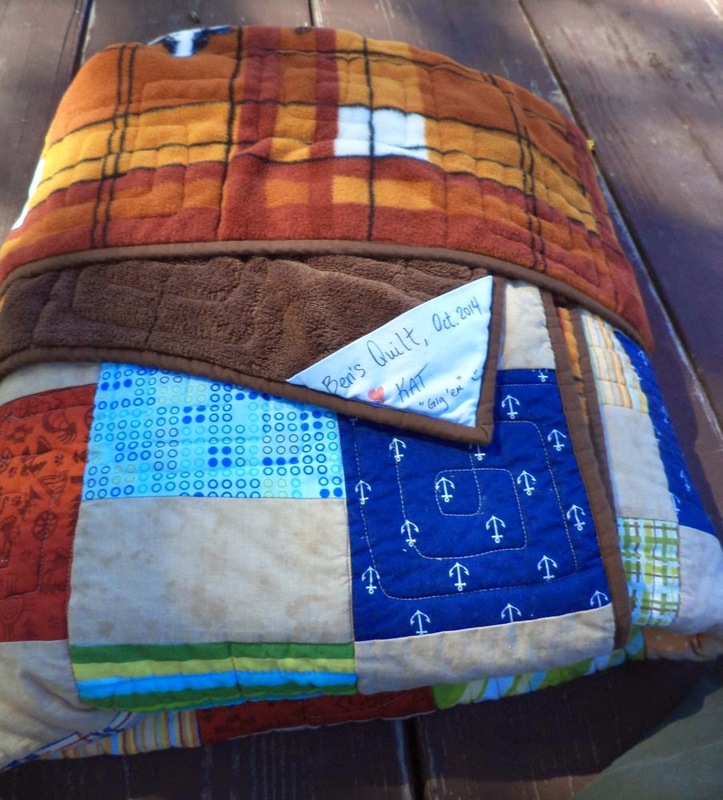 Ben's quilt looks cozy - he'll enjoy it.